It is not often that you can walk into a restaurant, and then walk out later totally satisfied in every way. Now I am fairly hard to please and it takes a lot to keep me really happy. However The Black Venus Inn at Challacombe managed, miraculously in my view, to tick all of my many and varied boxes. Marc & Liz Birch are at the helm of this family run business, with daughter Louise & her mum running front of house. Darren their son is the culinary genius leading his small, but talented team in the kitchen behind the scenes. This classic English character pub is cosy, busy and warm and is situated in a gentle dip amongst the rolling hills, a mere stone’s throw from the Somerset border. First thing you need to realise when entering the Black Venus is that there are no menus. Well there are, but they are just not on the table. In fact, the entire range of dishes on offer are to be found on various blackboards dotted about the premises. And it was to these that my eldest daughter & I went to choose our meals for the night. I commenced my culinary journey with the Special Chefs Starter, ‘The Black Pudding Stack’, layered with leeks and bacon with a wholegrain mustard sauce. If that sounds rather delicious then you would be on the money. It was without doubt a delightful and mouth-watering treat. The lovely salty taste of the bacon woven in amongst the juicy, tender leeks made a fabulous addition to the star of this dish. Attended by a flavoursome lake of wholegrain mustard sauce and lovingly decorated with red mustard frills, this starter was a real treat. Who would have thought that Black Pudding could have looked so beautiful? Part two for me came in the form of Chicken breast stuffed with brie, wrapped in bacon with a wholegrain mustard sauce (my choice, and worth repeating). In my opinion, the chicken was tender, and perfectly cooked. Again, the bacon wrap was a great accompaniment, cleverly complimenting the warm, soft brie core of this main offering. The bed of buttery, slightly salted crushed new potatoes was seasoned with black pepper. This combination of basic but important flavours was really tasty and delicious and completely hit the mark. The neatly arranged broccoli also received the thumbs up from me, as it was neither under or over-cooked. 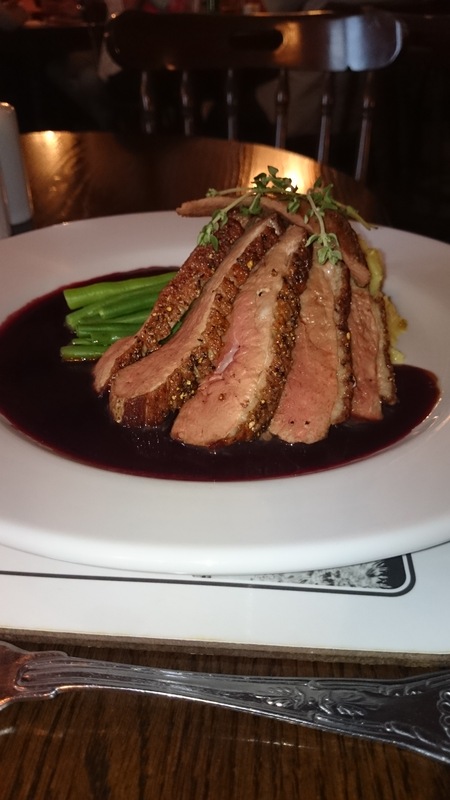 Across the table, Becky’s Duck Breast with a Port & Thyme Jus was akin to a work of art on a plate, describing it as ‘succulent and tender with a beautiful, crusty edge.’ Hmmm, sounds great to me! It was attended by perfectly cooked green beans, and the dish was a simple masterpiece in terms of taste and appearance. The finale came in the form of a homemade chocolate torte. I was not in any way disappointed. The torte was a luxuriant, chocolate sensation – and very moreish. It was accompanied by locally sourced ice cream, sitting on a bed of broken wafers. A smattering of icing sugar and a rich chocolate sauce completed this superb dessert. Becky’s Lemon cheesecake was a lovely, tangy foil for all the preceding richness of the evening, guaranteed to cleanse the palette in the best way possible. Created by Darren and his team, it made a refreshing change on the pub dessert landscape. Marc, Liz, Darren & Louise really are running a tidy ship here and fully deserve recognition on the culinary scene. In my opinion, and I don’t think this is overstating the case, but the food served that night was near perfect. It was tasty, plentiful, hot, well presented, good value for money and came with great service. And the simple English pub, homey atmosphere of The Black Venus is just great. Posted on Nov 13, 2015 Sep 28, 2016 by John RabyPosted in Food, Published WorksTagged Exmoor, Fine Dining, Food, Restaurants.